I'm so glad it's the weekend, and am looking forward to just staying at home and cozying up.. I know it might sound weird, but I love when Dubai get's a little grey.. It feels more like a real city, and is a nice change from the always bright and sunny days which feel like a constant holiday.. I guess it reminds me of growing up in Paris, where most of the days are grey and gloomy.. And as Dubai was running the marathon earlier this rainy morning, I slept in for the first time in quite a while.. So as I'm feeling a little lazy and don't want to leave the house today, I'm preparing lunch with what I have in my freezer, a few beautiful cod fillets which are perfect to make my baked fish and chips with.. I remember eating the best fish and chips with Phiras in Portobello in London a few year ago, and ever since I've been a big fan of this British classic.. The great part of this recipe is that it's a light version, so nothing fried, but you still get your yummy fix..
Preheat the oven to 200C. In a bowl, toss the potatoes, pepper, salt and rosemary. Lay them out on a tray lined with parchment paper and bake for 20 minutes. Turn the potatoes on the other side, and bake for another 20 minutes. In the mean time, season the fish with salt and pepper. Then set out three plates, one containing flour, the other the egg, and the last one the bread crumbs. Now drench the fillets in the flour, remove any excess, then dip it in the egg, and finally coat generously with the bread crumbs. Bake in the oven for 10 – 12 minutes (depending on the thickness). 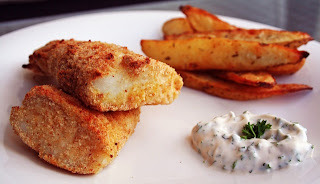 Make the dip, whisking the mayonnaise, mustard and herbs and serve with the fish and chips. Bon Appétit!